Marrickville's home of watermelon pilsner. The three musketeers at The Grifter Brewing Company have been around the block. After starting off contract brewing out of Young Henrys back in 2012 and creating beers for the likes of Noma for their 2016 Australian residency, these gents have been busy over the past few years. The name itself refers to the teams' background as home brewers. "The name Grifter was a suggestion from a friend,"says brewer Glenn Wignall, who is one of three behind Grifter, along with co-brewer Matt King and designer Trent Evans. "A grifter is a bit of a shady guy and since we came from a home brewing background, with no formal education in brewing, we felt it kind of fit." After purchasing the YH equipment they first brewed out of and opening their Marrickville brewery at the tail-end of 2015, the three friends have opened an impressive cellar door that is already a community favourite. The brewery has been a great addition to the Marrickville craft beer family with Batch Brewing Company and BlackFont Brewhouse just around the corner. The eight-tap bar is located in a high-ceiling warehouse which maintains an industrial and minimalist fit-out. 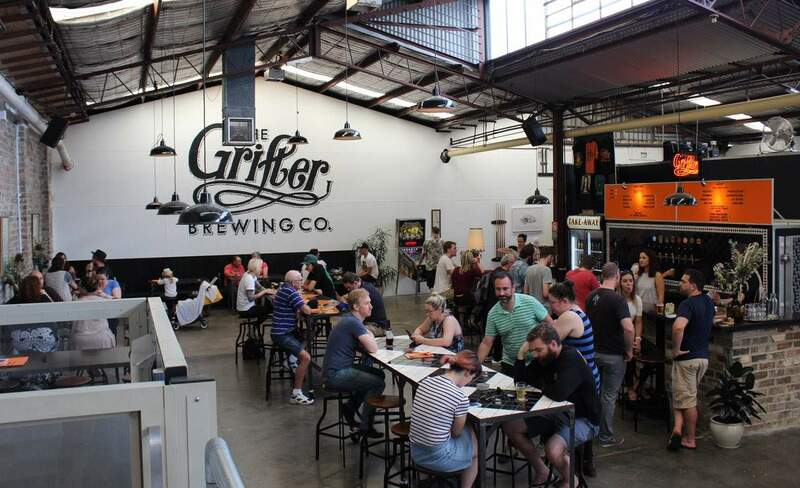 The brick bar was handmade with friends and family, as was most of the taproom, with the exception of the benchtops, which are the handiwork of Brisbane carpenters Blackwood Collective. Meanwhile, the pool room — an ode to their relationship with Cricketers Arms — is singular among the Sydney craft breweries and a draw card in itself. The main draw, of course, is the beer — and the brewery is a haven for local collaboration. The super exclusive Landlord Old Ale, created for Noma Australia using roasted macadamia nuts, has previously been on tap at the brewery, along with their Serpent's Kiss — a watermelon pilsner made with the team at Frankie's — and a Cobra coffee brown ale using beans from local roasters The Golden Cobra. The brewery's exclusive taps allow for experimentation alongside their core range. "There's a freedom in our beer that gives us a chance to try something different and always have something new on tap for people to try," says King. Their core range, including the Omen oatmeal stout, the Big Sur IPA and Fresh and Clean IPL, are all worth visiting for in themselves. Grifter will continue to partner with the local community on the food side as well and won't stop at their partnership with Hartsyard — three-course dinners with Bovine and Swine are also in the pipeline. If you haven't already visited as part of our DIY Walking Tour, it's time to get those sneaks on.